One app will help transcribe speech to text and the other will help amplify certain sounds and minimize others. This morning Google unveiled two new apps aimed at tackling accessibility issues for people living with hearing loss. One focuses on quickly translating everyday speech into text, and the second focuses on amplifying sounds for the user. 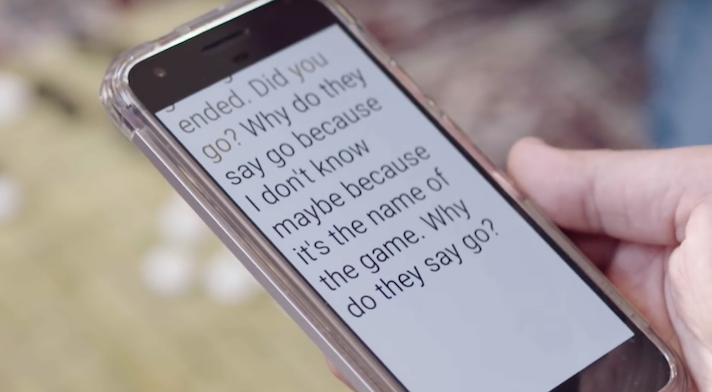 The first, called Live Transcribe, is app that uses a phone’s microphone to turn real-world speech into captions, according to a blog post released by Google. In order to develop the technology Google teamed up with Gallaudet University, a college specifically for deaf and hard of hearing people. Representatives from Gallaudet were able to give feedback on the tool and provide guidance about what was needed. According to the blog post, the app is available in 70 languages and dialects and lets people use a type-back keyboard, so that people who are not able to or choose not to talk, can communicate too. Google’s CART, a service that is able to let people join a meeting and create a transcription of the spoken dialog, was the precursor to the latest technology. But the new technology will let users access the transcription tools in a more casual setting. “All of the technology existed already. It was just a matter of hooking the wires together,” Chet Gnegy, a developer at Google, said in a video explaining the new technology. The second technology is called the Sound Amplifier, and like its name suggests it can boost, filter and augment sounds so that people who are hard of hearing can enjoy a better quality of sound. The technology was designed to boost quiet sounds and minimize background noise. Users can control the the different noise inputs with a slider on the app. Live Transcribe will be gradually rolled out in the Play Store, and Sound Amplifier is currently avilable on the Play Store. Around 15 percent of American adults, or 37.5 million people aged 18 and older, have some trouble hearing, according to the National Institute on Deafness and Other Communication Disorders. Worldwide that number rises to 466 million, according to the World Health Organization. Hearing loss is particularly prevalent in older adults impacting around one in three people between the ages of 65 and 74 and close to half of adults over 75, according to the National Institute on Aging. In a recent interview with MobiHealthNews, AARP’s Dr. Charlotte Yeh stressed that hearing loss is a prevalent condition among older adults which can lead to isolation and loneliness. With so much talk in the space of how the big Silicon Valley Tech giants are getting into health, the hearing loss industry is just one more example of a field potentially ripe for the taking. Hearing loss tools are becoming increasingly popular in the digital health space. Only last week New York City-based Lively launched a telehealth service that will allow users to complete an online hearing assessment, conduct a virtual video consultation with an audiologist and have their device remotely tuned. But the list of digitally enable hearing tools goes on. Last September ReSound LiNX Quattro launched a connected hearing aid with remote adjustment features similar to Lively’s, while 2017 saw Cochlear Limited’s connected hearing implant receive the green light from the FDA.